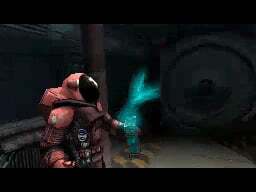 A science fiction FPS on DS? Lunacy! The DS’s heritage for first-person shooters has been a little – wait for it! 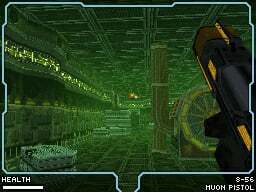 – hit and miss over the years, with Metroid Prime: Hunters singlehandedly flying the flag as titles such as GoldenEye: Rogue Agent drag the poor machine’s name through the dirt. One developer determined to craft the handheld’s definitive first-person experience is Renegade Kid, whose first title Dementium: The Ward took a horror-based approach to the genre, but Moon sees them taking the FPS into sci-fi territory. The first thing you’ll likely notice about Moon is the quality of the graphics – Renegade Kid’s engine is among the most advanced on DS and the resolution is extremely impressive at first. Seeing the astronaut’s suits rendered so crisply is a level above the vast majority of other developers’ output on the system, and the accompanying CGI videos are every bit as impressive, although there is some unfortunate blockiness in certain videos. There’s some fantastic detail in each level too – computer screens and readouts displaying schematics, machines packing and transporting unidentified vials and some nice lighting effects as glowing bullets pass down corridors. Once you’ve managed to look past the engine’s crispness and smooth frame rate, you’ll find it handles exactly as you would expect – the stylus is for looking, the D-pad moves your character and L-button fires, although you can switch to the opposite buttons if you’re a lefty. This streamlining of controls is striking: there’s no use of buttons to scroll weapons or open inventories for example, and it makes Moon extremely accessible from the start. A good deal of the story is delivered in voiced cutscenes or speech, all of which is generally well written and crystal clear. The game’s sound on the whole is pretty good, and we recommend using good quality headphones, although if you do find the music or sound effects getting on your nerves you can turn them down or off in the options menu. 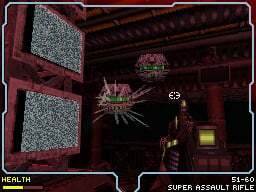 The game’s aural presentation certainly adds to the alien atmosphere, although it never quite reaches the frightening heights of Dementium: The Ward. Quite early in the game you’ll come across the Remote Access Droid, a tiny remote-controlled vehicle that’s used to overcome some of the security systems you’ll find in the game, usually by sneaking through tunnels and shooting electricity bolts at key targets. It can’t destroy enemies but it can neutralise them temporarily, so it becomes important to go about your business quickly, and you can switch between the RAD and Major Kane at any time by sliding the stylus over the appropriate icon. The only problem is the RAD has to be collected after every use, meaning a lot of backtracking, although as it is a truly invaluable piece of equipment it’s a necessary evil. Speaking of equipment, unlike most first-person shooters you don’t begin with a piddly pea-shooter, but rather a rapid fire “Super Assault Rifle” with unlimited ammo, before collecting weapons including high-powered pistols, shotguns and sniper lasers, each of which can have its maximum clip size upgraded by seeking out the upgrades within each level in one of Moon’s many Metroid-inspired features: your health bar can be upgraded in the same fashion. These aren’t the only collectibles you’ll find, though – each main episode contains three hidden artifacts, which when retrieved allow you access to extra training missions upon the level’s completion. They’re not essential but, combined with the game’s three difficulty levels and “quick play” mode that lets you see your best time, accuracy and other merits for each level, certainly extends Moon’s lifespan past the eight or so hours it’ll take you to complete the story mode the first time around. The only real complaint you can hurl at Moon is that it just isn’t varied enough. Impressive though the game engine is, it’s essentially powering near-identical corridors for hours on end, although the above-surface exploration sections in LOLA RR-10 work well to break up the monotony. What’s worse is that you soon realise that the enemies all have very similar attack patterns – some will fire a single energy bullet, others three in a spread, but they can all be taken down with a simple strafe and shoot technique. It’s a shame there isn’t more variety in the game’s enemies as they sadly bring the game’s quality down, and make it feel less like an out-and-out first-person shooter than an adventure game with some flawed shooting sections. 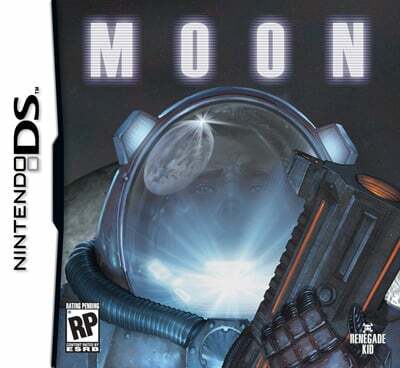 If you’re a fan of first-person shooters on DS, you really only have a few decent options, and Moon is certainly among them: it looks and sounds great, has a well put-together story and controls very smoothly indeed. 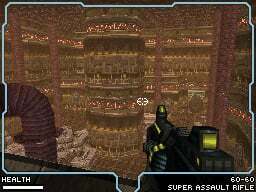 Although the shooting sections are fun, and some of the game’s boss battles are very impressive, there’s not a huge amount of variety in the standard levels or the enemies that inhabit them, so although the story is compelling be aware you’ll be doing a lot of the same between the start and the game’s climax. I really wanted this when it first came out, but I didn't have a DS at the time. I wonder if it's still easy to find. Thanks for the reminder! Looks alright, I'll be getting it! Looks pretty good, I'll consider getting this sometime. Lack of online play and local multiplayer is what turns me off. I've been wanting this one for a while. I saw it at Best Buy but got GTA Chinatown Wars instead. I'll have to get this soon. This has got REALLY mixed reviews. Some reviewers have given it around 5 or 6 whilst you guys have given it an 8. That caption is bad. I still want to pick this up, but other games keep getting in the way. "If you’re a fan of first-person shooters shooters on DS"
Shouldn't there only be 1 shooters? I played through all of the game, its definatly an 8/10. It is sort of short though. "I really wanted this when it FIRST came out,"
Oh, you just had to say that! I bought this recently and if you look past some very generic templates (character design for example), you'll find a really fun shooter that nicely combines action and exploration. It's like a cross between Doom and the 1st Metroid Prime. Not entirely a must have but still a recommended play. I would've given it a 7. I think an 8 is a little high of a score for this game. That is just my opinion thoug. This is the first reason I've had to pick up the DS in a loooong time (I don't really do handhelds, books r handheld). I want this though cos I'm a sci-fi freak (& an fps 1 too). Looks like Metroid Prime mixed with Onslaught. I don't mind checking it out, but I'm running out of money to spend on games. And I also have several games too finish, so... I think I'll pas for now. I'll give this one a while, methinks. @Nanaki - I actually thought it was my reflection when I picked the box up for the first time. Now that is a frightening start to a game! Also, I will give this one a whirl. Not a while! Review was good, made me want to buy. I might buy this game. I would have rated this game 9/10 but still good review. I became addicted to this game for like 5 days straight... but the final (?) boss was just a bit too ridiculous. Huge step up from the previous boss or the previous level. It's going to take so many tries I just havent spent time on it yet. Otherwise it was a pretty amazing game... I agree I'd give it a 9. I'd pick it up if I hadn't already overstrained my budget and still got CoD4 DS around fairly unplayed (though I think that game DEFINES repetition). The first mission involving use of the LOLA, it's pretty much a straight drive past some barriers and into a garage area with a platform large enough for you to park the LOLA on. DO NOT park on the platform! Later on (Chapter 6) you'll come to a point where you need to use the LOLA again, and if you parked on the platform (like I did), you'll go up to it and start to enter, but before you're fully inside the platform will rise to the next area, where you will suddenly be LOLA-less and trapped, with no way to get back to the lower area. Again, to avoid this glitch, park the LOLA outside the garage area (or just someplace not on the platform!). When you get to Chapter 6, enter the LOLA and then drive it onto the platform (don't get out, lol). That should get you through the glitch area. Hmm. Might pick this up. Is it still easy to find? For anyone that is worried about the budget about this game (or anyone trying to find it, like #29), I got it at Best Buy for only $20, and it's quite good. I haven't been playing alot (I've been really busy), but with what I've played, it's quite fun. WOW!!!!!!!!!!!!!!!!!!!!!!!!! Regenade Kid did great! I agree with Nintendo Life this time. its defenitly an 8/10.